Until now, only a sparse selection of Golshiri’s fiction has been available in English translation—three short stories, a novella written under a pseudonym, and his novel Prince Ehtejab, which was made into a film. 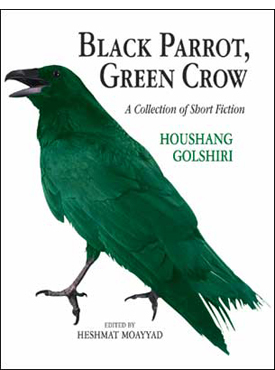 Now, Black Parrot, Green Crow brings together the largest collection of Golshiri’s writings in any language—eighteen short stories and three poems. They span the arc of Golshiri’s career as a writer, from his days as a young student in Isfahan under the Pahlavi regime, to the 1980s and 1990s, and the disappointment of the Iranian people with the Islamic Republic. Golshiri’s stories, crafted with a withering irony, expose the fanatical and draconian political apparatus of tyrannical regimes, while his wry humor and delicate sensitivity to the human condition tempers the blistering satire, making the narratives short but nonetheless harrowing and touching tragedies. The tales are filled with the uncertainty of life in a culture undergoing drastic change, and hauntingly etch the plight of the individual in a climate of political oppression. “HOUSHANG GOLSHIRI (1937-2000) was a master stylist who wrote dense, elliptical prose, often with a (more or less) disguised political content. He edited an influential literary journal and in 1968 was a founder of the Iranian Writers Association, a group that protested governmental censorship and worked for the basic rights of writers. Both the Pahlavi regime and the Islamic Republic imprisoned him for his antigovernment views and banned his books in Iran. The present collection of eighteen short stories and three poems has been selected from his many published works and gives a fair cross section of how Golshiri wrote and thought. “One of Golshiri’s favorite literary devices is an interior monologue or dialogue, in which the narrator, generally but not always male, speaks mostly to himself or carries on a dialogue with someone not present. Sometimes the narration takes the form of a letter. Many of his stories must be read with careful attention to determine who is speaking, who is responding, and what they are talking about. This kind of forced engagement of the reader is worth the effort, however, because only through active engagement are the riches of the stories revealed. All the stories but one are set in Iran; the one set in Germany is atypical, as if the change of setting prevented Golshiri from grappling with his favorite issues. As the reader may have noticed, the title of the present collection is deceptively similar to the name of the shortest and least elaborate of the stories included here, namely “Green as a Parrot, Black as a Crow.” This story is, or perhaps appears to be, as simple as any children’s story. Compared to Houshang Golshiri’s other stories, both its plot and its style of narration seem surprisingly plain, if not feeble and even dull. However, anyone familiar with the political atmosphere of Iran—and the ongoing confrontations between the clerical authorities of the regime and the modernist writers and intellectuals—would be likely to assume that the usually quick-witted author must have intended to make an encoded statement in this seemingly harmless parable. After all, the story was first published in 1983, only four years into the reign of the new regime, a time when the battle to crush any resistance to the dictates of the theocratic state was still in full flare. This new regime did not satisfy the expectations of the liberal poets and writers who, once again, felt cheated by the leaders of a state that had benefited from their full support during the revolution. Now, instead of the promised freedom and justice, the “green parrot” was delivering the “black crow” of the ominous days to come. Golshiri’s life and, in a way, his achievements as one of Iran’s leading writers of the second half of the twentieth century, mirror, at least partly, the history and fate of his fellow Iranians. Endowed with talent and intelligence, and possessed by the firm resolve to overcome the extreme poverty and hardships that fate had imposed on his parents and siblings, Golshiri, to a great extent, succeeded in shaping his own life, becoming a model of astute intellectual leadership, in turn animating a generation of aspiring writers. He struggled to improve his personal life, as the nation had struggled many times for freedom and reform since the middle of the nineteenth century. Golshiri was born in 1937 in Isfahan. His difficult childhood years were first spent there, and later on in Abadan where his father had found a blue-collar job in the oil industry. In 1954 the family returned to Isfahan where Golshiri finished high school. Already in those early years as a teenager and high school student he felt a responsibility to help his family overcome their humble circumstances, even as he sought to improve and shape his own future. During the next twenty years, while earning a Master of Arts degree in Persian Literature, he held various menial jobs and taught at elementary and high schools in Isfahan and the surrounding villages. Methl-e Hamisheh (As Ever), written in Isfahan in 1968, was his first collection and included seven short stories. Only a year later, his best-known short novel, Shazdeh Ehtejab (Prince Ehtejab), followed. In 1971, still in Isfahan, his third book Kristin va Kid (Christine and the Kid) was published. It consists of seven interrelated stories, allegedly portraying his love affair with a British woman, who at the time lived in Isfahan with her husband and child. Four years later, in 1975, Namazkhaneh-ye Kuchek-e man (My Small Prayer Room) came out, offering nine stories. These volumes were followed in rapid succession by fourteen other books, some short story collections and novels, others essays and literary studies. Nobody seems to know exactly how many papers and stories Golshiri left unpublished at the time of his death in June 2000. There exists, for example, a large novel called Barreh-ye Gom-shodeh-ye Ra’i (The Shepherd’s Lost Lamb), the first volume of which was published in 1977. The remainder, an unknown number of volumes, has been censored and never released. Some other works follow: Jennameh (The Book of the Jinnis), published by an Iranian publisher in exile (Baran Publishers, Stockholm 1998). Ma’sum-e Panjom, ya Hadith-e Zendeh bar Dar kardan-e an Savari keh khwahad amad (Innocent Five or the Story of the Hanging of the Knight Who Shall Come), a novel (Tehran 1979). Jobbeh-Khaneh (Arsenal), four short stories (Tehran 1983). Panj Ganj (Five Treasures), five short stories (Stockholm 1989). Tafannoni dar Tanz (An Attempt at Satirical Writing), a novel (Stockholm 1991) A’ineh-ha-ye Dardar (Mirrors in Doors), a novel (Tehran 1992). Dast-e Tarik, Dast-e Rowshan (Dark Hand, Bright Hand), five short stories (Tehran 1995). King of the Benighted, the English translation of Shah-e siyah pushan, published by Mage Publishers in 1990 under the pseudonym Manuchehr Irani. The original Persian was published by Baran Publishers in 2001 in Sweden. This novella resounds with the voices of two political prisoners narrating the savage treatment to which the opponents of the regime, amongst them innocent women and girls, are subjected. The narration is introduced by a short version of one of the seven stories of Nezami’s epic poem Haft Peykar (The Seven Beauties), composed in 1197. I know of no commentary ever written about Nezami’s poem which is more penetrating than Golshiri’s application of its symbolic relevance to the political reality of the period during which he wrote. Golshiri also wrote a few plays and film scripts. Shortly before he died, his essays and critical articles appeared in a two-volume set called Bagh dar Bagh (Gardens Within Gardens). Golshiri was familiar with modern trends of thought and techniques developed in the twentieth century. William Faulkner, whose work Golshiri had read in Persian translations, is mentioned by his students and friends as his most important source of inspiration. As for content, however, Prince Ehtejab must be considered entirely a creation of Golshiri’s mind and experience. Unlike Hedayat’s Buf-e Kur, which in its surrealistic, psychic, and almost ethereal world of bitterness and despair, that offers only distant allusions to Iranian art and social experience, Prince Ehtejab by contrast depicts with nearly realistic details the decaying figure of a typical member of the ruling Qajar dynasty in the early years of the twentieth century. Golshiri, unlike Hedayat, did not come from a privileged aristocratic background. Whereas Hedayat, a rather lonely, pessimistic individual who at the age of forty-eight committed suicide, never actively participated in any political movement, Golshiri was deeply committed to the fight against social injustice and political despotism in his homeland. His sincerity and devotion to this task was matched by his restless and energetic activity that never slowed in spite of dangers and threats all around him. Golshiri was one of a handful of Iranian novelists who developed a style of his own. It consists, for the greater part, of a patching together of events, which take place under a variety of circumstances, and conversations between different individuals at different times. The reader has to follow the gradual emergence of a fascinating story by putting these scattered pieces together like a puzzle. Golshiri crafted this cryptic style skillfully, aiming, perhaps, at the intelligence and seriousness of his readers. He certainly discouraged simple-minded individuals and, more importantly, meant to fool or mislead police and security agents whose disposition towards any criticism leveled against state policies was not exactly benevolent. However, instead of the code words then current among intellectual opponents of the regime (like “night,” for example, to mean the dark ongoing period of the monarchy soon to be followed by the daylight of freedom), Golshiri chose to devise methods—allegories and ambiguity in characters, shifting times and places, and disguising real intentions or directions—in order to divert the attention of the ever-suspicious authorities. The gender-blindness of the Persian language served him well as a useful tool to fool impatient or superficial readers and exhaust their willingness to continue reading an exasperating text, being unable to untangle its complex structure and dig deeper into the layers of the intended messages. Sometimes he begins a story, or a paragraph, in its middle with a verb. For example with “goft,” without announcing the subject Golshiri leaves it to the reader to discover whether it was “he” or “she” who “said” or “spoke” or “answered” or only “thought to himself,” with all of the possibilities conveying a meaning, each one in a given context. The reader must read attentively and carefully look for clues to untie the complicated connections. This clever, mischievous use of a linguistic trick increases the tense expectation of the reader and, like a detective story, raises the level of suspense and uncertainty in the story. Golshiri had the nature of a political fighter. His participation in the antiestablishment struggles of the 1970s was not limited to the use of the power of his pen. He also took part in the early stages of political activities that were organized by teachers, students, and other dissident groups. His involvement landed him in jail twice for several months in 1962 and 1974 on charges of “wrong” political affiliations and extremist views. He was one of the prominent members of the Writers Association of Iran that was formed in 1968 but soon fell apart under the unacceptable demands and conditions set by the government to hold tight control over their activities. In 1977, on the eve of the Islamic Revolution of 1978–79, the Writers Association of Iran was revived, this time more vigorous in its aspirations and enjoying greater support from academic and professional anti-regime circles. The so-called “Ten Nights” of reading poems and delivering provocative speeches against the system of suppression and censorship by fifty-nine poets and speakers, sponsored by the Writers Association of Iran and was hosted by the German Goethe Institute in Tehran from October 10 to 19, 1977, an unprecedented occasion for the Iranian intelligentsia to air their grievances and celebrate their victory. According to all accounts, Golshiri played a significant role at different stages of this successful event. The joyous mood of freedom following the revolution did not last more than a few months, if not only a few weeks, at least for the young anti-reactionary and modernist segments of the population. The anticipated freedom failed to materialize. The enthusiasm of the masses was dashed all too soon. Persecutions and the mechanism of censorship reappeared more fiercely and less compromising than ever before, only this time blasphemously, in the name of religion and God. Golshiri, like his fellow writers and other progressive segments of society, was completely disillusioned yet remained determined to continue his efforts for the achievement of the cherished goal of freedom and justice. He did not join the stream of Iranians who, like never before in the recorded history of Iran, left their homes and started a new existence on other continents. Instead, Golshiri decided to stay, to write, to fight, and to train a new generation of younger talents. His courage as a writer who would not be tempted by any compromise that offered less than the complete and perfect freedom of speech, exposed him to serious and life-threatening dangers. As reported, even leaving his house to run a simple errand became a risky undertaking. It was very hard on his wife, who often feared she might not see him again. As for the quality of his writings, mounting threats forced him to pull the camouflage cover of his style tighter and use even less understandable allegories. Energetic participation in all sorts of literary events, repeated trips to Europe, the even faster pace of creative writing and publishing inside and outside of Iran, the steady contributions to journals, the training of younger talents in the art of novelistic writing, and even more daring and risky attempts to revive the above mentioned Writers Association of Iran in the post-revolutionary period could not stop a growing sense of disillusionment from penetrating his mind and soul. Without withdrawing from any one of the activities that were still permitted, he grew more philosophical and less jovial and exuberant. This does not suggest that his earlier works are overflowing with happiness and hope. It simply indicates that earlier on he was more of an optimist, that he still had faith in the ability and sincerity of his fellow Iranians, and that he could not believe that they would once again succumb to the promises of an outmoded regime that theoretically had outlived the validity of its claim. The four stories titled “Portrait of an Innocent” belong to an earlier period. They depict a rather spooky environment, especially the third one, with the masterfully woven warp and woof of its texture of classical romanticism and modern realism. The second one, however, ridicules the old practice of some Iranian Shiah villagers who, for reasons of prestige and economic prosperity, would create a place of reverence that then would develop into a center for religious ceremonies for the surrounding areas. In one such village the inhabitants plan to erect a respectable grave, an Imamzadeh, claiming it to be the resting place of a martyred seyyed, a distant descendant of the prophet Mohammad through his daughter Fatima. Golshiri turns this practice into a farce by having the villagers plan the decapitation of a simple seyyed, proclaiming him as a martyred saint of Islam. The most amusing device in this process is the utter stupidity of the victim. During ceremonies and feasting, down to the last moment, it does not occur to the seyyed to wonder or ask why the villagers honor him in such undue fashion and feed him so lavishly. A glance at another story of this period, “My China Doll,” illustrates how effectively Golshiri applies the internal monologue technique to the feelings of a little girl. Talking to her broken china doll and a dwarf while arranging and rearranging them in a room, the girl imitates her mother’s and grandmother’s speech patterns and behavior, thus subconsciously mirroring what we know to be the plight of her father in jail. The story in its three levels of the imprisoned father, the broken doll, and the disrupted life of the family is a sad and touching comment on the insecure political conditions of the times. The story “The Man with the Red Tie” demonstrates Golshiri’s sarcasm and humor in a refreshingly obvious manner. It is the mocking description of a savak (National Organization for Intelligence and Security)5 agent who is charged with the job of watching an innocent person and collecting information about him. The man’s red tie—taken as a sign of political affiliation—arouses the agency’s suspicion. What starts out sounding like a serious detective story turns into a brilliant farce with many hilarious details. In the serious story titled “Both Sides of a Coin,” the narrator sounds like a historian debating with himself—in the style of an internal monologue—searching for an answer to the reality of Iran’s history and its never-stabilizing political turmoil during the last two centuries. It seems that the narrator, who is identical to the prisoner in the story, is holding a mirror in front of the eyes of the recent generation of Iranians to show them the recurring process of their repeated rises and falls, and the faces of their kings, leaders, heroes, political victims, and honest martyrs who all reappear without the present generation having learned a lesson from them. In this as in a few other stories (like in “Portrait of an Innocent IV”), Golshiri engages his characters in a debate about the never-ending failures of the political systems, repressive regimes, police brutality, ignorance of the masses, and lack of liberty and safety—particularly for intellectuals and dissidents. However, the stories written immediately after the Islamic Revolution are hopelessly bitter, shocking, and dispirited. Panj Ganj (Five Treasures), the volume demonstrating this depressing reaction to the events following the change of regime, could not appear in Iran and was only published years later in 1989 in Sweden. “What Has Happened to Us, Barbad” and “My Nirvana,” two stories from this particular volume included here, are eloquent testimonies to the mood of that period. “What Has Happened to Us, Barbad” expresses even in the rhetorical question of its title, the plight of a family that instead of celebrating victory is plunged into disappointments and physical and psychological troubles, including their young son’s loss of speech. In the second story, “My Nirvana,” the sense of defeat leads to a religio-philosophical emptiness of life. The woman, who loves living in freedom and luxury, takes her husband’s money and leaves for London, while the increasingly ill and helpless husband, an accomplished and respected judge, continues his miserable existence with the help of a maidservant. The Buddhist concept of Nirvana appears as the final solution, a closing circle for this unhappy and hopeless life on earth. Golshiri was one of the few Iranian writers whose writings reached Europe and beyond in his own lifetime. The presence of a large contingent of Iranian immigrants in European countries and the United States increased awareness about writers such as Golshiri, and at the same time facilitated the process of inviting them for speaking events and organizing academic and ethnic Iranian audiences. Golshiri’s first trip to the United States in 1978 was made possible through an invitation from the International Writing Program. He visited Iowa City, where he spent several months. In the following years he repeatedly traveled to Europe and participated in conferences and gatherings with Iranians, gave talks, and read from his works at numerous universities. Bern in Switzerland; Berlin, Bonn, Aachen, Heidelberg, Hanover, Köln, Düsseldorf, Bremen, and Frankfurt in Germany; Rotterdam and Amsterdam in Holland; and London and Paris are places he visited. He was a welcome guest at the Heinrich Böll Haus in Germany, once even with a stipend for nine months.6 Germany honored him by awarding him the Erich Maria Remarque Peace Prize.7 Golshiri’s thank-you speech, given at the award ceremony in Osnabrück, Germany, in July 1999, was printed in the prestigious German daily paper Die Frankfurter Allgemeine Zeitung on July 29, 1999. In 1992 he came to the United States for the second time and visited Iranian communities in Boston, New York, New Jersey, Houston, Los Angeles, and Chicago (where in addition to giving a public talk he spent one evening at our home where a number of friends, colleagues, and students had gathered to celebrate the publication of A Chicago Anthology. Stories from Iran, 1921—1991). I had never met Golshiri before. Due to orthopedic surgery I was homebound for a number of months and thus was not aware that Golshiri was in town. The day before the celebration party for Stories from Iran the phone rang. A voice on the other end of the line said in casual Persian and in a mockingly reproachful tone: “Aqa, tomorrow evening you have a party at your house and you have not invited me! How come?” It was Golshiri. Needless to say, my wife and I were delighted. The next evening, April 25, 1992, the first guest to arrive for the party was Golshiri. I welcomed him. We embraced. And it felt like seeing an old and familiar friend. His cordiality, the lack of pretentiousness, the absence of vanity, and the expression of genuine sincerity in his face and words were enough to win the affection of those who did not know much about him. The other guests arrived. Dinner was served. And several hours passed in enjoyable conversation. Each guest received two copies of Stories from Iran: A Chicago Anthology and everyone present signed all copies. After a while, noticing that nobody smoked and no alcohol was served, he asked laughingly: “What is this, man? No smoke? No drink? How then do you live?” “Well, that is why they kill us [my Baha’i coreligionists] in Iran.” The answer was, of course, sarcastic and Golshiri burst out into boisterous laughter. I took him to the next room and opened the window. He smoked some cigarettes and we talked. But his throat remained “dry,” as he put it. Later that evening, before the guests started to leave, he read part of a story he had written about a trip—real or imaginary—of the poet Mehdi Akhavan Saless from Tehran to Mashhad. He gave me the copy before he left. Shortly after his death I was able to publish that story in the magazine Kaveh (in Munich), not knowing that it had been published that same year, shortly before he died, in Bagh dar Bagh, a collection of his essays and articles.8 The translation of this story, “The Story of a Storyteller,” is included in the present collection. Golshiri’s untimely death on June 5, 2000—he was only sixty-three years old—shocked Iranians everywhere. Thousands of people accompanied the casket through the city streets of Tehran to the cemetery to bid farewell to this much admired advocate of freedom and human rights. The New York Times remembered him in an obituary on June 12, 2000. I cherish his memory—as perhaps everyone who knew him does—as a powerful and creative writer who fought for freedom, and as a person who was honest, unassuming, intelligent, and restlessly active. He will be remembered as one of the best writers of Iran in the twentieth century—one who made Persian literature richer and more enjoyable.